The Fashion Mate Singer sewing machine is a portable sewing machine with 70 different stitches, six button hole settings, automatic needle threader, a free-arm for sewing small clothing and hard to reach areas and an LED readout. Several different feet types are included, such as a small repair kit and bobbins. 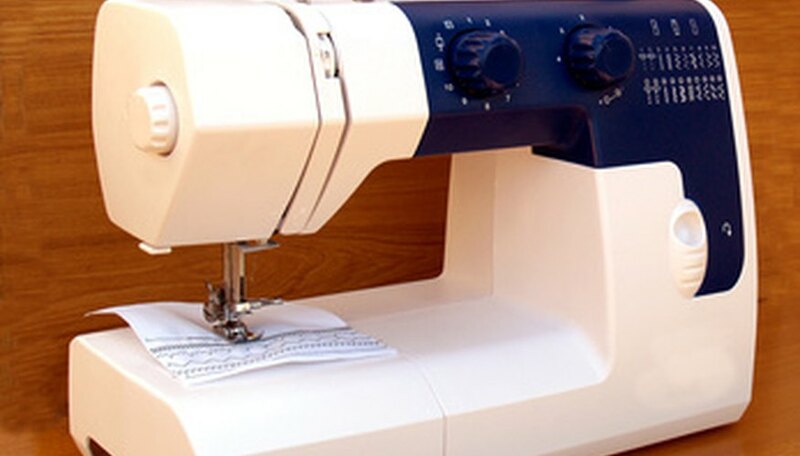 As of 2011, the Fashion Mate Singer Sewing Machine is priced between $129 and $199. While the variety of stitch selections can make this Singer sewing machine seem complicated, it is actually simple to use. Plug in the Fashion Mate Singer sewing machine and press the "On" button. Put a spool of thread on the spool pin, and hold it in place with the spool pin cap. Unwind the thread from the spool and thread it through the tension disks, hooks and guides on the Fashion Mate Singer sewing machine. Thread the bobbin through its top rim hole, extend a few inches of thread, and place the bobbin on the bobbin shaft. Move the shaft arm to the left to hold the bobbin in place. Hold the thread end, and press down on the sewing machine peddle to wind thread around the bobbin. Let up on the peddle as the bobbin becomes full of thread. Cut the thread with scissors and place the bobbin in its case. Pull about 4 inches of thread from the bobbin, insert it in the bobbin groove under the spring wire, and click the case shut. Drop the bobbin into its compartment. Raise the presser foot lever to raise the foot and release the thread tension. Crank the hand wheel towards you to lift the needle to its highest point. Check the machine's threading, ensuring that the thread has no slack and that the thread takes up lever is threaded from right to left. Thread the needle from front to back, and leave about 4 inches of thread hanging from the needle. Lower the presser lever to lower the foot, crank the hand wheel away from you, and press down on the sewing machine's pedal so that the top thread and the bobbin thread are caught in a loop together. Press the stitch selector to choose the stitch you would like to use. Raise the presser lever to raise the sewing machine's foot. Crank the hand wheel towards you to raise the needle. Place your material under the needle where you desire the stitches to start. Lower the presser lever to lower the sewing machine's foot. Crank the hand wheel forward to lower the needle to the material. Press down on the pedal slowly to move forward a few stitches. Lift up from the pedal for a moment. Press down on the pedal again, and guide your material away from you to stitch over your initial stitches to lock the in place. Move the material back towards you to continue stitching to the end of the material. Move the material away from you again to reverse the stitching and lock it in place. Raise the presser lever to raise the sewing machine's foot. Crank back on the hand wheel to raise the needle. Pull the top and bobbin threads towards the back of the sewing machine, and cut them with scissors.